2Wheel Chick: Cyclo Cross Round Up - The Hapless Rider ! The last couple of London League rounds have been in Sussex. I don't ride there very often so didn't really know what to expect. What I did notice was how hilly the courses were - just at a time when I was distinctly disadvantaged ! This was a bit of an ordeal. Having fallen and badly hurt my arm the previous day I was not in a position to ride particularly strongly. In fact I was unable to hold the bars of my cyclo cross bike so ended up using the mountain bike. So a painful arm and a chunkier bike which did not compare with the slick machines of my fellow competitors was never going to bode well. Still, I wanted to give it my best shot, hence I showed up at the start line. The warm up had been a very hot affair, given the hill and the fact that I was still in my warm up gear. Realising that I was going to have to work harder than the other women just to keep level with anyone I decided to remove my long sleeves and race in fingerless gloves to reduce any risk of overheating during the race. After 3 laps my arms were freezing, my fingers were even colder, and the brisk cold wind brought with it a blast of driving rain and sleet. By the end of the race my fingers were shivering so much that I couldn't operate the gears. Mistake number one. I took it easy going up the hill on the early laps and spun a low gear, thinking that although I was at the back, as the race progressed I would eventually catch someone whose fuel level would have run low. No one got tired, in fact the wind probably whipped riders up into an even speedier frenzy just to keep warm !! I only began to put in more effort on the penultimate lap, but it was too late by then. Mistake number two. I wore my pink kit for this race on the premise that if I couldn't win, at least I could look stylish. I even lost out there ! The ladies' winner, Jenn Hopkins was not only the fastest, but in her Minx-Girl colourful skort and jersey suit she definitely looked the most stylish. Immediately I crossed the line I dashed back to the car to thaw out and put the race the behind me. My arm was slightly better for this one, but still not recovered enough for me to use the cross bike. I was resigned to taking the mountain bike again, but more resigned to not making the same mistakes as before. I'd dress appropriately, set off hard, and just wear my no-frills blue kit. The weather was incredibly mild for November, so I just wore shorts and my short-sleeved jersey. I know I got that bit right. The hill was so much steeper, and longer than at Stanmer Park. But I wasn't afraid - I was going to power myself up it - ride my first lap like it's my last, really develop a killer instinct, ride like an animal etc. etc. Immediately the whistle was blown the hard work began. Straight up a long steep hill. I powered along, a fellow competitor shouting at me "spin, woman, change down!" I just ground away on a hard gear. My quads were burning, but I didn't mind because I was in a bunch. However, the downhill that we eventually got was not much of a reward for me. It twisted very technically through the trees, and the wood chippings made it rather slippery. In fact I found it rather frightening. I soldiered on nevertheless, with my rivals right on my tail. As soon as we hit the more open descents they overtook me. The numerous false flats really drained the energy out of my legs, and I began to pay for the mistake I'd made with my gearing early on in the race. Still, I was determined to catch my rivals even as they sailed past me and I steadily drifted backwards. But alas, my pedalling became more laboured as I began to suffer from general fatigue. When I realised I was too tired to be able to control my bike on the tricky descents I started pulling into the side to allow faster riders (practically the whole of the field) to get past me. Naturally I lost even more time on my fellow competitors and waved goodbye to any chance of moving up the women's rankings. A couple of people fell, including one guy who had a nasty collision with a tree stump. In spite of that I was still unable to catch anyone. 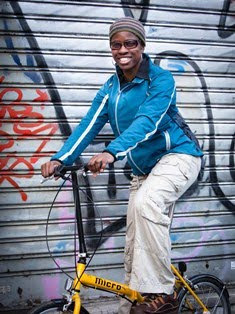 Finally, I decided to change down to a low gear and just easy-spin my way round. That gave me time to recover, and on the last lap I even managed to overtake a 60-year-old man I'd been sparring with throughout the race ! I'm not sure if that was meant to make me feel better. Ok, so two races in which I tried different approaches - neither of which worked. But it's all in the learning as they say. 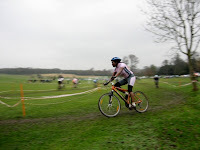 This weekend we'll be back at Stanmer Park, and I shall be on my cross bike. Hurrah ! Who knows, I might be more fortunate next time around.